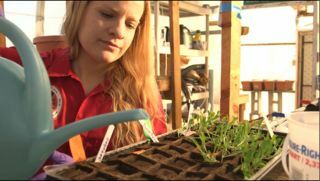 Michaela Musilova, a member of the mock Mars mission Crew 134, works with plants during an experiment at the Mars Desert Research Station habitat in January 2014. Kai Staats, documentary filmmaker and member of the MarsCrew134 team, contributed this article to SPACE.com's Expert Voices: Op-Ed & Insights. Michaela Musilova is looking for life — in the extreme. Her research is in extremophiles, organisms that live in extreme environments such as the glaciers of Greenland; the high, dry desert of Utah; and eventually, perhaps, on the surface of Mars or in the oceans of Europa. As humans increase our awareness of how many diverse forms life does take, and at the same time improve our techniques for investigation, we grow more likely to discover life off our home planet. While telescopes analyze the light from the atmosphere of planets eclipsed by orbiting distant stars, we continue to press our fingers and tools into the soil beneath our feet to look for life which may represent what we will some day find on Mars. To learn more about MarsCrew134, visit www.marscrew134.org.